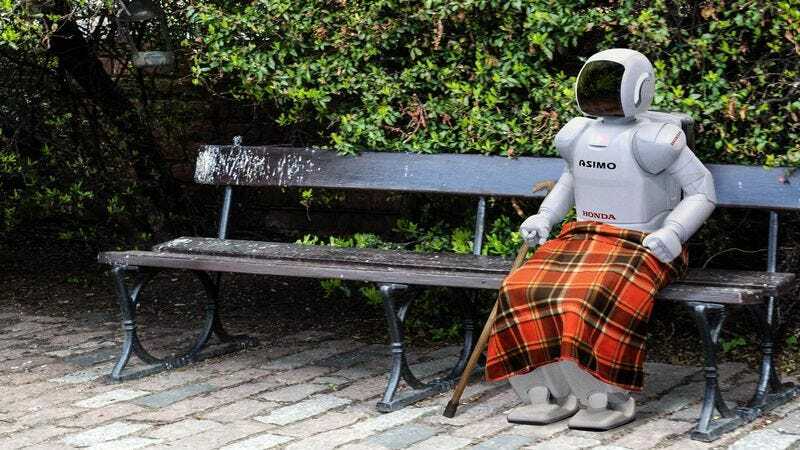 KYOTO, JAPAN—Saying the move to the assisted care facility was the right decision after so many years of operation, members of the Akiyama family finally put their aging robot in a retirement home, sources reported Friday. “It’ll be much happier here in this community where it can be around older droids that were all manufactured around the same time and that’ll have lots of things in common with it,” said Makoto Akiyama, adding that he knew the time had come after noticing the elderly automaton’s memory had deteriorated to the point where it was not even making 5 trillion calculations per second. “Plus, the servo motors in its joints have worn away, which has made walking or grasping objects with its pincers extremely painful. But at this group residence, he’ll have a physical therapist that can help maximize his mobility as well as a programmer on hand 24 hours a day in case he gets a virus.” At press time, the family admitted to reporters that they were relieved the robot was in someone else’s hands now, as replacing its components had become a burden and giving it oil baths was unbearably awkward.